FirstDown PlayBook sent an email out last week, and we asked our youth football coaches what we could do on the defensive side of the ball to help them more in 2018 as we prepare our playbook information for the fall season. 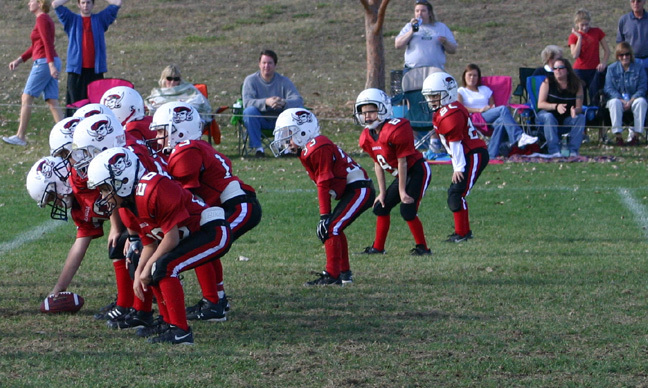 A re-occuring theme showed up as many of our youth football coaches described having to defend spread out formations similar to what you would normally see in high school or even college. We have addressed that issue here before on the FirstDown PlayBook Coaches Community website, but we want to hit it head on early this year because if enough of our youth football coaches are bringing it up then it must be getting pretty common out there. At first glance this would seem logical. Youth football teams are normally better at running the ball than they are at throwing it. Even in the run game, a lot of youth football offensive schemes involve mis-direction as opposed to brute blocking at the point of attack because the younger kids are normally not ready for the physicality of power schemes yet. However, with a second glance,the most obvious reason for running a spread offense becomes evident. After the first one or two practices the coaches look around and see that they have one or two players that are significantly more talented than the rest of the team. The coaches know if they can just get one of these players in space with the ball, good things are going to happen for their offense. So the next thing you know, you have a youth offense that is spread sideline to sideline and a very talented quarterback standing next to a very talented running back with only five or six defenders near the line of scrimmage to defend them. This can be good for the offense but we think bad for the players and even bad for the game of football itself. When a youth football coach runs a spread offense, they essentially take four or five of his or her players and gets them out of the way so the star player can make something happen with his or her feet. Since often times the defense is playing man coverage at this age level, all of the outside players on offense are just releasing and running their defender off with them. This does not cultivate a lot of learning when it comes to football skills and techniques which should be one of the main reasons there are youth football leagues to begin with. What Can A Youth Football Coach Do To Combat This Offense? It is our opinion that the youth offensive coaches who run spread offenses with nine and ten year olds do it because defensive coaches allow them to. Today, FirstDown PlayBook has created this video designed to help youth football coaches who are being forced to deal with spread offenses. This video will show you ways to defend it with the FirstDown PlayBook Youth Defensive section and if you absolutely have to you can lean on the FirstDown PlayBook Varsity Defense section. Take a look.